The microscopic larvae of the razor clam are free-swimming for the first 5 to 16 weeks. The long, narrow shell of the razor clam may attain a length greater than 7 inches. In very young specimens, the periostracum, or outermost tissue-like layer of the shell, is brown. It gradually becomes yellowish-brown in medium-sized animals and changes again to brown with age. The periostracum of large or old specimens is usually eroded. The inside of the shell is glossy white, sometimes with purple areas showing through and a prominent rib extends from the upper or early part of the shell to the shell edge. Razor clams may become sexually mature as early as the end of its third growing season or following the formation of the third annulus ring; all are probably sexually mature by the time they enter their seventh growing season. Breeding occurs between May and September and is closely associated with rising water temperatures. A temperature of 55°F is believed to be required to trigger spawning. The sexes are separate in razor clams. In breeding, eggs and sperm are discharged onto wet sand and into sea water. Fertilization occurs by chance. Where the razor clam's reproductive cycle lacks efficiency, it compensates with numbers. Although an exact count of the number of eggs contained in a female razor clam is not possible, some researchers have estimated that number at somewhere between 300 thousand and 118.5 million. The larger the female razor clam, the greater the number of eggs produced. It goes without saying that the chance of survival for an individual egg is very, very low. The microscopic larvae bear little resemblance to parent clams. They possess short, hair-like projections called cilia with which they propel themselves. Toward the end of this free-swimming period, which may last from 5 to 16 weeks, the shells begin to form and the young start looking like clams. The young clams take up residence in the sand where their growth rate varies from area to area. Some razor clams in Alaska have attained the age of 18 years, and it's possible that older individuals exist. Razor clams subsist on minute plant and animal life known as plankton filtered from the surrounding seawater. Some people are naturally allergic to shellfish. An illness may also be the result of polluted habitat or storage of clams at too high a temperature. Another source of illness is paralytic shellfish poisoning (PSP) which is caused by the razor clams' ingestion of a one-celled organism that may pass over the clam’s growing area. Rarely, small cysts can be seen imbedded in the siphon of the razor clam. These cysts are one of the intermediate stages in the life cycle of a parasitic nematode (round worm) of the common skate. They evidently do not affect the razor clam. By thorough cleaning and cooking, this parasite can be eliminated. Occasionally, a small pink or white leach-like animal may be found attached to the inside of the siphon. This is a ribbon worm that lives commensally with the razor clam. Commensals are animals or plants that live with other organisms and reap benefit from the activities of the host but cause them no harm. The worm is easily removed and does not in any way make the clam unfit to use as food. The Arctic razor clam is found in southern Cook Inlet westward to the Bering Sea and Siberia. The Pacific razor clam is more widely distributed and is found from Pismo, California, north to the Aleutian Islands. The Pacific razor clam is the more frequently encountered of the two species. Razor clams live in surf-swept and somewhat protected sand beaches of the open ocean. They are found from approximately 4 feet above the mean low water level down to depths of 30 fathoms. The overall status of the razor clam in Alaska is healthy. Overexploitation is always a threat to any species. 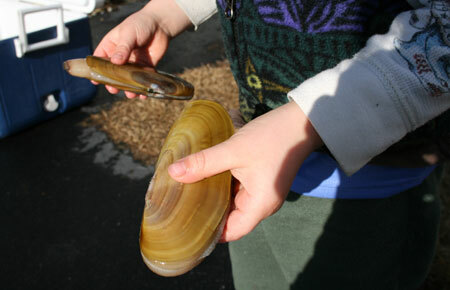 With continued proper management and sound stewardship, the razor clam will be available for future generations. 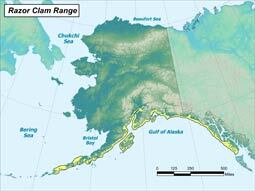 The Arctic razor clam is found in southern Cook Inlet westward to the Bering Sea and Siberia. The Pacific razor clam is more widely distributed and is found from Pismo, California, north to the Aleutian Islands. The Pacific razor clam is the more frequently encountered of the two species. Razor clams subsist on minute plants and animal life known as plankton filtered from the surrounding seawater. Breeding occurs between May and September and is closely associated with rising water temperatures. In breeding, eggs and sperm are discharged onto wet sand and into sea water. Fertilization occurs by chance.